I suppose it is finally time to write this blog post, as I have been thinking about this repeatedly over the past year. Ever since I began collecting Dollfie Dream seriously, I have always wanted to write a FAQ guide for beginners who are interested in acquiring the “ready made” image character Dollfie Dream; since the distribution mechanism for Dollfie Dream is rather tricky and different from everything else most people are accustomed to. Basically, it was rather difficult to track down the relevant information related to acquiring a Dollfie Dream. There are numerous sites out there with wealth of information related to Dollfie Dream, but finding the relevant information is like looking for a needle in a haystack, so my goal is to cover just enough basic information and answer some frequently asked questions for those of you who are interested in acquiring the limited release image character Dollfie Dream. What is a Dollfie Dream? Just what exactly is a Dollfie Dream? (For the sake of simplicity, I will just cover the most relevant topic, which is the DD Basic Body 2/DDIF) Dollfie Dream is a line of 60cm tall (or 1/3 scale) character doll made by a company called Volks (there are other companies which make similar dolls, but it’s outside the scope of this topic), which is composed of a highly articulated Dollfie Dream Inner Frame DDIF covered by various hard/soft vinyl skin parts and customized head mold and face-up. In July of 2011, Volks introduced the new generation Dollfie Dream Base Body III, which is based on a brand new skeleton design with improved movement range. It is believed that all new Dollfie Dream will sport that DD III going forward. There is also a 50cm tall body called Dollfie Dream Sister, the basic design is almost identical to that of DD III. In Volks News 47 published on February 2012, Volks announced they will be releasing a renewed version of the Dollfie Dream Dynamite body called Dollfie Dream Dynamite III in Home Town Dolpa Kyoto 9 with a similar type of upgrade as seem in Dollfie Dream III body. It is believed that the old body will be phased out and be replaced with the new body type. In July 2012, Volks introduced the new 一体型 unibody torso through the idolm@ster Dollfie Dream Sister, which by definition, feature a seamless torso at the expense of limited flexibility compare to the standard model. However, the limited flexibility is most definitely compensated by the beauty of seamless body line. Dolls or Ball Jointed Dolls in general have often time been portrayed as a feminine hobby, so why do I collect them? Good question! I am a guy after all! Even back when I was actively collecting PVC figurines, I have always been fond large scale figure. Dollfie Dream offers what I can best describe as the ultimate representation of the characters I adore to-date. And in contrary to popular believe, the target audience for these Dollfie Dream is actually Japanese male and that’s why majority of these Dollfie Dream Image Characters are mostly chosen from popular anime or eroge games (to appeal to the male audience obviously). That’s not to say Dollfie Dream is only for male, there are in fact plenty of female collectors as well. And with the ability customize them with different outfits, wigs and eyes, Dollfie Dream just offer so much more in terms of “sense of presence” than fixed pose figure could ever hope to achieve. Personally, Dollfie Dream are just perfect for me to create and capture special images based on the characters that I like. With proper photographing technique, it’s even possible for Dollfie Dream to behave in a life like manner due to their superior craftsmanship and scale. Here is a Dollfie Dream family photo taken on 2010. 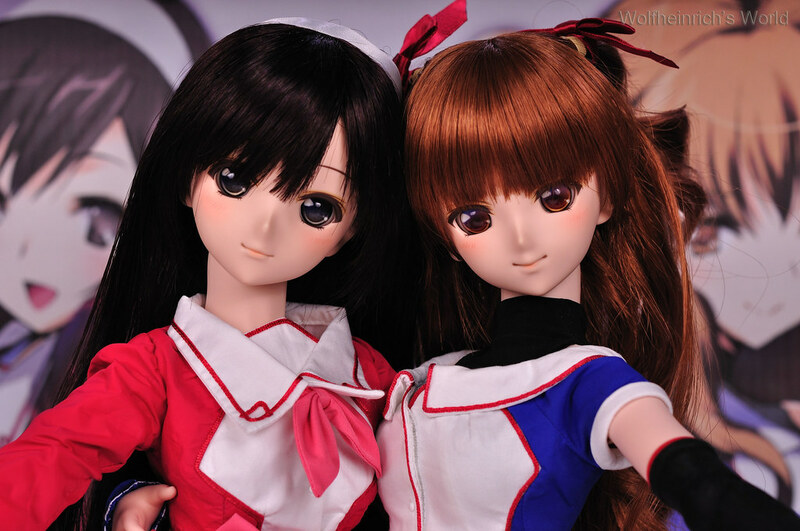 And here is the Dollfie Dream from the White Album Project, Yuki Morikawa Dollfie and Rina Ogata Dollfie. And here is my lovely Kiriha Kuze Dollfie from the popular visual novel Fortune Arterial. Where Can I find Dollfie Dream? In exception to the Volks standard release Image Characters DD Aoi and DD Yukino (more could be added in the future) as of September 2012, Volks has finally taken the steps to strengthen their standard model line up (partly contributed by the overwhelming popularity of DDH-06 prepainted version) by introducing three additional models, MDD Rena, DDS Mayu and DDdy Miko. The new models are expected to go on sale in DD Gathering 2012. Otherwise, majority of the Image Dollfie Dream Characters are only available at Volks’ special event known as a Doll Party, an event that held roughly 4 times a year where Volks would introduce their new character dolls. A very important note is that all Dollfie Dream released through a Doll Party event are only produced to a limited quantity due to licensing agreement to respective copyright holders and are considered “Limited Item”, once they are sold out, there is no reliable way to acquire them from Volks again. Popular image characters such as Saber, Rin Tohsaka, Tamaki Kosaka and Kusugawa Sasara were all released through Doll Party events, a comprehensive list of previously released image characters can be found here. There are alternative means to acquire them in the secondary market which I will talk about later. There is, however, an exception to this rule in recent years through some special collaboration projects such as Tengen Toppa Gurren Lagann Dollfie Dream, White Album Dollfie Dream Project, TYPE-MOON x Dollfie Dream Project Pre-Order and most recently, the Xenosaga III X Dollfie Dream (featuring KOS-MOS Ver. 4 and M.O.M.O.) project here the respective Dollfie Dream were not distributed through a Doll Party but instead were available through Pre-Order directly from Volks Website; however, once they are sold out, they are sold out. Most limited Dollfie Dream are usually priced somewhere in 50000-60000 yen region (some are more expensive), so roughly 600-750 USD based today’s currency exchange rate. Although priced much higher than the basic image characters, limited release Dollfie Dream comes with their own default wig and clothes modeled after the original image character, and they usually offer the best value as a package. Alternatively, Volks also sell all the necessary raw components for you to build your own image character to your liking, however, that is outside the scope of this topic and won’t be covered here. 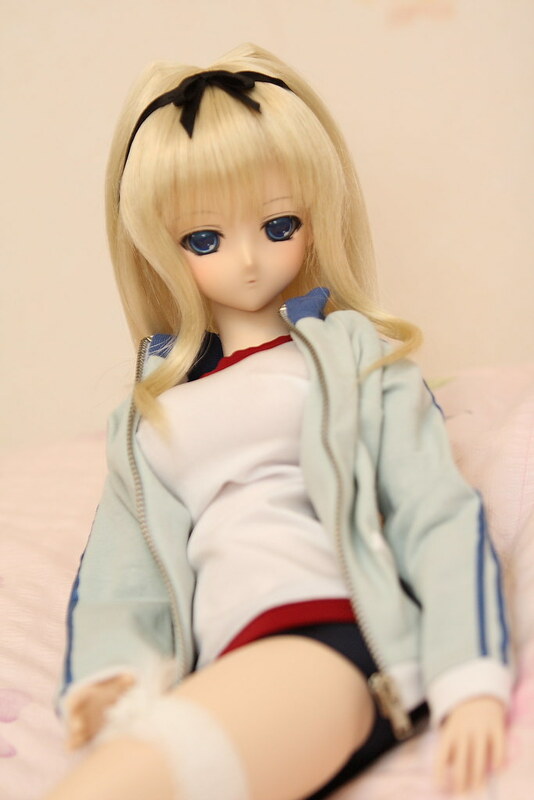 How Can I Acquire A Dollfie Dream? Enter the Volks USA Lottery if you live in USA, Canada and Mexico. Enter the Volks Doll Party After Event Lottery if your country of residence is outside of Volks USA service region. Although you won’t be charged for entering the Volks USA lottery, you do need to complete the payment information; in essence, you are committing to buy the Dollfie Dream if you happen to be among the winners of the lottery draw. The After Event Lottery event is specifically setup for people who lives outside of Japan or unable to attend the Doll Party personally for a chance to acquire the same items as if you were attending the Doll Party. I must stress that by entering the lottery, you only have a chance to buy these items and there is no guarantee what-so-ever you can acquire the items you want to and that will bring us to the After Market strategy. There are several internet websites I am aware of that offer a limited listing of Dollfie Dream. If you can’t find what you are looking for, then you might have to resort into Yahoo Japan Auction. The use of deputy service to acquire Dollfie Dream is another comprehensive topic in itself and since this is merely a beginner’s guide so I won’t be covering it in details here. Has a discussion section with over 100 posts full of DD info, also up to date DD head mold list etc… very active DD group. Not specifically dedicated to Dollfie Dream, but has a pretty active Dollfie Dream and Mini Dollfie Dream thread, as well as Dollfie Dream “wiki” articles. Q: I saw this gorgeous Dollfie Dream Photo of (Tamaki or Sasara or Saber or Rin Tohsaka, etc etc.) where can I get one? A: As I mentioned previously, those are limited release Dollfie Dream in past Dolpa events, they are completely sold out and can only be acquired in the After Market. Q: Is there any chance that past popular Dollfie Dream could be available again? A: Unfortunately, no one really has the answer and it’s not likely to happen. A: Due to popular demand, several popular Dollfie Dream such as Moe and Saber Alter have been getting a version 2 treatment. This does not mean that Volks will definitely go back and re-issue all popular models but this is a good start. Q: I saw Dannychoo’s Mirai Saber and I wanted one just like her! A: Danny’s Mirai Saber is a semi-custom work, the dress is made by Doll Seamstress Chun at http://puppy52dolls.com/ and it’s not commercially available at this point. A proper guide is badly needed! I know I was badly confused when I first started! Pretty good guide (especially the part where you mention I am your mentor hehehe ^^). Now any newbie question can be easily answered by copy pasting this link. It’s time to finally do it…. I have been thinking over it for several months but laziness got to me. However, seeing one too many newbie asking for help is pushing me over the cliff so to speak… haha. Really good guide, you answer a lot of important questions. The goal here is to explain the basic information for newcomer. I am limited? No wonder onii-chan is so protective of me. ._. Great post, I agree with ‘alafista’s’ statement that we need more guides out there like this. I’m really considering making a custom daughter so my Sakura has a sister. I’ve found a few articles about it but not as many as I’d like to see. If I decided to do that I’ll be sure to do a step by step post on my site for others to see as well. Hope you do one on custom dolls some day! Thanks for the guide,now I know where to refer to once I’m ready for a daughter. Thanks to your guide, now I know ho to buy it. Now it is just saving and waiting for the Kyoto After Event! Thankyou for your guide it helped me. I’m not sure where to leave this question, but I was wondering about the customs fees associated with buying from overseas. If I ordered something, say, from http://www.dollfieworld.com, what would happen with customs? I’ve never done that before and I know there are fees but I’m not sure where they come into play? Buying DD from dollfieworld is no different from buy figure from anywhere. 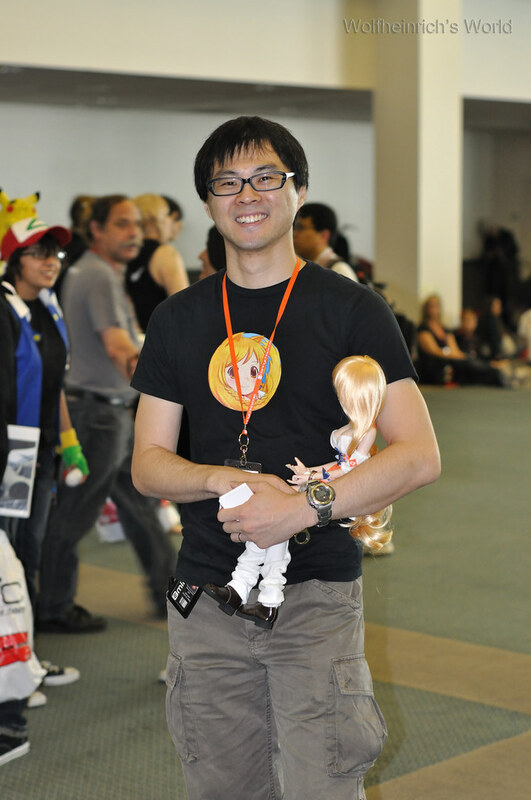 Unless you live in a country that has regulation against doll, there should be no problem. They don’t all cost thousands of dollars, there are a handful of collaboration programs that allow customer to pre-order certain characters for a few hundred dollars. Shigure Kai Ni (PVC Figure) Good Smile Company has been restocked. Parfom Aigis (PVC Figure) Phat Company has been restocked. Chivalry of a Failed Knight [Stella Vermillion] (PVC Figure) Broccoli starts to be reserved. Decadence Beauty Marie Mamiya x Hazuki Kuryu (PVC Figure) SkyTube starts to be reserved. Decadence Beauty Marie Mamiya from Starless (PVC Figure) SkyTube starts to be reserved.